SouthSouthNorth (SSN) came into being when Hélène Connor (HELIO International), Emilio La Rovere, (COPPE UFRJ), Steve Thorne, and Stef Raubenheimer met during the climate change negotiations under the United Nations Framework Convention on Climate Change (UNFCCC) in Bonn, Germany, in late 1999. The Clean Development Mechanism (CDM), a component of the Kyoto Protocol which was at that point under negotiation, aimed to partner developed and developing nations to create greenhouse gas emission reduction credits through projects in the developing world. Little was known about the rules to be imposed under the CDM, or how the sustainable development requirement contained in Article 12 of the Protocol would be institutionalised, determined or measured. The three presented a paper setting out a theoretical tool for appraising the sustainable development contribution of potential CDM project ideas according to a list of criteria and indicators. The tool found support, and a new partnership emerged, bringing together institutions dealing with climate change in the Netherlands, France, Brazil, South Africa, Bangladesh and Indonesia to experiment with actual projects in a number of Southern countries. By the end of 2008 SSN had diversified and added a number of new projects to its portfolio. These spanned training, support practice, and facilitation, all in the fields of climate and development. For the years 2009 and 2010, SSN’s portfolio included work with, among others, United Nations Industrial Development Organisation (UNIDO), the United Nations Institute for Training and Research (UNITAR), the United Nations Development Programme (UNDP), the Global Environment Facility (GEF), the Danish Government, Foreign and Common Wealth Office (FCO) and others. 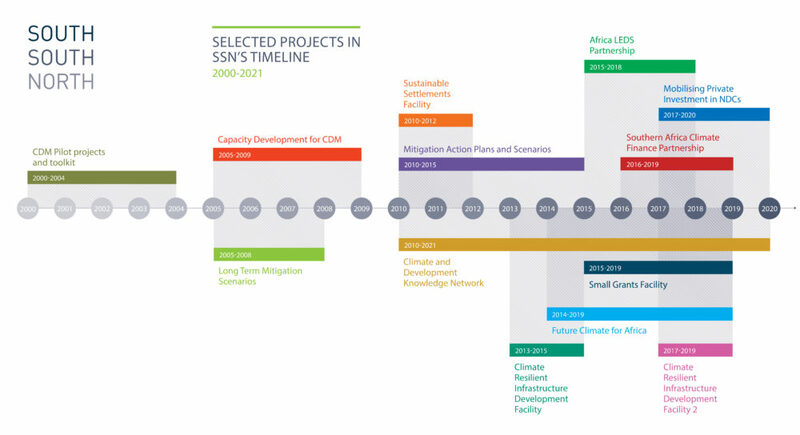 In 2010 SSN successfully bid as part of a consortium for the 5-year, £60m Department for International Development (DFID) and the Netherlands Ministry of Foreign Affairs (MINBUZA) project that became known as the Climate and Development Knowledge Network (CDKN). At about the same time SSN and the Energy Research Centre (ERC) at the University of Cape Town (UCT) were approached by Kate Hampton of the Children’s Investment Fund Foundation (CIFF), and the Mitigation Action Plans and Scenarios (MAPS) Programme was formed. As SSN has continued to grow, so has our inventory of projects and partnerships, as we build a reputation for consistently high quality delivery, and meaningful engagement. Notable among these are Future Climate for Africa (FCFA), the Small Grants Facility (SGF), the Southern Africa Climate Finance Partnership (SACFP), the Africa LEDS Partnership (AfLP), the Climate Resilient Infrastructure Development Facility (CRIDF), and Mobilising Investment for NDC Implementation. The varying time-spans and overlapping nature of these projects are a testament to SSN’s principles of flexibility and the connectivity in all our work. The SSN Group comprises three entities: SSN Non-Profit Company (NPC), SSN Pty Ltd and SSN Trust. The NPC is the primary vehicle for delivering the bulk of SSN’s work. This legal structure gives us the flexibility to collaborate with a variety of partners and entities. In 2011, SSN converted from a section 21 company to a non-profit company and adopted a new Memorandum of Incorporation (MoI), consistent with the 2008 Companies Act. In accordance with its MoI, SSN NPC’s Directors are accountable to Associates. SSN NPC has Public Benefit Organisation status that entitles it to tax exemptions as stipulated under the (South African) Income Tax Act (Act 58 of 1962 as amended). The SSN Trust is used primarily for fund management purposes. The Trust administers funds and manages on-granting both in and outside South Africa. The Trust is regulated by the Trust Property Control Act (Act 7 of 1988 as amended) and is governed by a Board of Trustees, who provide an additional layer of oversight. The Trust has administered well over €20m to date. SSN Pty Ltd operates as a commercial entity, undertaking consulting and other ‘for-profit’ work that would not fit within the statutory (specifically tax exemption) scope of the NPC. All profits from SSN Pty Ltd are passed on to the NPC as part of its longer-term sustainability plan. A climate resilient world, where ethical and equitable resource management drives a sustainable future. We mobilise capabilities and resources to enable equitable, climate-resilient development. Supporting decision-makers to implement climate compatible development. We facilitate stakeholder engagement by working through existing networks, thereby strengthening relationships. Our knowledge of interrelated processes and policy, and our access to relevant expertise, allows us to work in a flexible and adaptable way. We believe that effective stewardship of donor funds is key, but in combination with the provision of appropriate alternatives to the traditional consultancy models.